Portion-mania: problematic for waists and waste. But could McDonald’s be on to something? | Dana Gunders’s Blog | Switchboard, from NRDC – Is it possible that McDonald’s is doing something right? Removing trays from dining halls cuts food waste – Khaleej Times – A simple strategy to reduce food waste. Be a Hero! Help Stop Fresh Food Waste and Get a Green Wallet with the New Green Savings Hero Partner Program from the Green Refrigerator Machine by Ozonator – Yahoo! News – Ozone technology in the Green Refrigerator Machine extends the shelf life of perishable foods, gives families more time to eat their fresh foods. Reducing Food Waste During the Holiday Season | Worldwatch Institute – A few things to keep in mind over the holidays, when we tend to waste even more than usual. Hilton Hotels to Share Food Waste in Hungry Egypt | Green Prophet – Hilton Worldwide has launched a pilot program to distribute surplus food to community organizations that feed the poor in Egypt. Students turn waste food into meals – Wilmette Life – The Campus Kitchen Project is a nationwide non-profit with 33 participating colleges and high schools. Composting option resolves some companies’ waste woes | The Tennessean | tennessean.com – Turning waste from breweries into compost. For those of you in L.A., this is just a small reminder that I’ll be speaking at Westfield Century City on Tuesday as part of the CODA Electric Vehicle Speaker Series. If you’d plan to attend, RSVP to concierge@codaautomotive.com by October 29. JM Gets a New Hydration Station – Joaquin Moraga Intermediate School installed its first “Hydration Station” at the school last month, and paid for it from savings the school achieved by diverting food waste and turning it into electrical energy. Business Rx: Food Recovery Networks seeks steady income stream – The Washington Post – Student-run Food Recovery Network seeks revenue stream to make it financially self-sustaining in the long term. 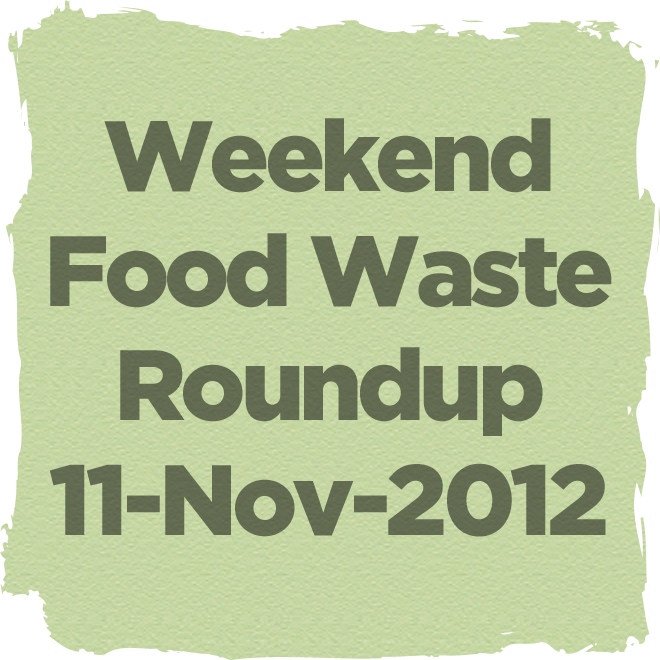 The ups and downs of food waste? Brazil favelas maid fights food waste with ‘viagra’ in Italy – The Malaysian Insider – Regina Tchelly teaches others how to reduce waste in her cooking classes, by showing them how to make such dishes as banana peel brigadeiro. She claims that her trademark dish, watermelon rind risotto, has viagra-like properties. I suppose that’s just as true of my watermelon rind chutney, which has the benefit of lasting longer. Bengaluru drowning in its own waste | GulfNews.com – Greater wealth has spawned more garbage, and the managers of the country’s development have been unable to handle the load. A Rise in Food Prices Could Stem the Tide of Food Waste · Environmental Management & Energy News · Environmental Leader Is cheaper always better? Smart Suzy: Ready for pumpkin-carving? Cut down on food waste, go green, deals | Our Smart Money — In this entry, Smart Suzy talks about creative ways to carve pumpkins, and about food waste, but doesn’t link the two topics. So what will you be doing with all that pumpkin flesh to keep it out of landfill? On The Point: GMOs, Food Waste, and Food as Entertainment | Slow Food Los Angeles — Interesting and thoughtful discussion, and a timely one for those in California who will be voting on prop 37. Dumping food waste – ABC South Australia – Australian Broadcasting Corporation (ABC) — This audio program, with two Aussie Food Waste Experts, shares tips and recipes to help reduce waste and save money. Study Finds That Cutting Food Waste Could Feed One Billion Hungry People | Inhabitat – Sustainable Design Innovation, Eco Architecture, Green Building — In inhabitat (an online magazine that promotes sustainable design), Kristine Lofgren reports on a study that our current approach to feeding 9 billion people may be short-sighted. This study found that approaches that cut food waste, rather than increase food production, could feed 1 billion people. Food waste is one raw material we have way too much of, and there are plenty of schemes to turn it into usable products. Waste could prove a money-spinner – Taipei Times — Entrepreneurs in Taiwan have developed new technologies to make the wasted sorghum grains into value-added products. Starbucks turns food waste into plastic | Green Futures Magazine — Meanwhile, Starbucks is looking to turn food waste into plastic. Composting in the Valley Cuts Down on Food Waste — Black Bear Composting is helping restaurants turn waste into compost for local farmers. I’m not sure this is helping reduce food waste, as the title claims, but it is a good way to divert it. Composting—Turning Garbage into Black Gold – State of the Planet — Food waste is now collected at 25 GrowNYC Greenmarket locations and many other sites in New York City for composting. Let Us Compost helps apartment dwellers, restaurants be more green | Online Athens — A new start-up that is providing a solution to help urban dwellers compost. Lebanon news – NOW Lebanon -Food for thought on World Food Day — Two great causes that go great together: food recovery and composting. 4 Mobile Apps Helping Minimize Waste in the Food Industry | Sustainable Cities Collective — This article seems to be making the rounds.